Aces: After skipping clay-court season for second year in a row, won title on grass at Stuttgart, then reached final at Halle before losing to Borna Coric, possible fourth-round opponent at Wimbledon. Topspin: Even as 37th birthday (Aug. 8) nears, tough to count out Federer at a tournament he’s won more times than any other man. Aces: Has not competed since winning record-extending 11th French Open title on June 10. … Four of past five Wimbledon losses came against opponents ranked 100th or worse. Topspin: Since reaching the final in five consecutive Wimbledon appearances from 2006-11, hasn’t been past the fourth round. Aces: Runner-up to Federer at two of the past four majors. 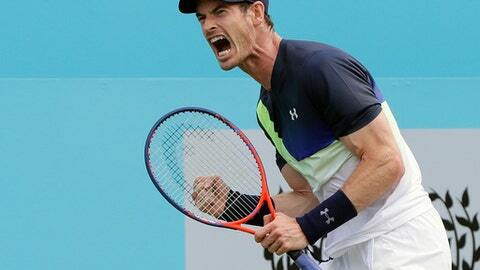 … Won Queen’s Club grass-court tuneup last week, beating Novak Djokovic in the final. Topspin: When his serve and forehand are clicking, he’s as big a threat as anyone to make a deep run. Aces: Back at career-best No. 4 in rankings after semifinal run at Roland Garros. Topspin: Biggest forehand in the game could carry him far at All England Club. Aces: Ranks 2nd in 2018 in aces and percentage of service games won. Topspin: Never has put together a second-week run at the place where in 2010 he won the longest tennis match in history. Aces: Reached 1st tour final in nearly a year last week, and it was on grass. Good sign as he tries to come back from right elbow troubles. Topspin: Has won 12 of past 15 matches after going 6-6 to start 2018. Aces: Only three players have hit more aces or won a higher percentage of service games this season. Topspin: If he can maintain focus and play up to his abilities, can go far on a surface that suits his game. Aces: Ranks 3rd among all active players in career percentage of return games won, trailing only Nadal and Djokovic. Topspin: Played only three matches in the last year because of hip surgery, but said Saturday he expects to be in action at Wimbledon, barring a sudden setback. … Streak of making at least QFs in last 10 Wimbledon appearances could be in danger.